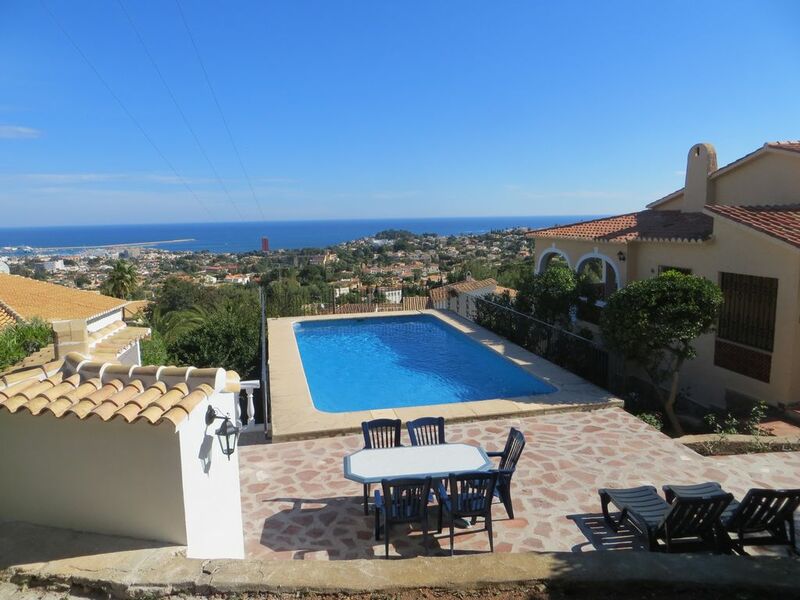 Very quiet villa on the slopes of Montgo, with private pool and garden, barbecue, beautiful views of the sea and Denia. The house is divided into two areas with separate entrance, the lower part has a small living room, bathroom, washing machine, 2 bedrooms and a small terrace. The upper part has a living room, kitchen with dishwasher, 3 bedrooms, 2 bathrooms and a large terrace. It has a private parking space. There is a bathroom with a bathtub and 2 with a shower. Angela House Very quiet villa on the slopes of Montgo, with private pool and garden, barbecue, beautiful views of the sea and Denia. The house is divided into two apartments with separate entrance, the lower part has a small living room, bathroom, washing machine, 2 bedrooms and a small terrace. The upper part has a living-dining room, kitchen with dishwasher, 3 bedrooms, 2 bathrooms and a large terrace. It has a private parking space Capacity: 10 people. Location: 3 km from Denia and the beach 3 km Inputs and outputs: Every Saturday. From 4:00 p.m. and they must leave the house at 10.00 h. Payment conditions: 40% at the time of booking and the rest 40 days before entry. Deposit: In the moment of receiving the keys you have to pay a deposit of Euro 500, - Expenses to pay upon arrival: Final cleaning Euro 120. Rental of sheets Euros10. Pets Euros 40. Dénia, you know how to live! Dénia is located in the northern part of the province of Alicante, in a place whose climate stands out for its warmth and the multitude of sunny days it offers, with an annual average of 20º. Dénia stands out for the beauty of its beaches, for the typical location of an urban area where the Castle rises majestically in the center, by Montgó Mountain, declared Natural Park and located a few meters from the sea, by the coming and going of boats of fishing that mark the daily life and provide Dénia with the best of the sea, turning it into a culinary city par excellence.